Today I head out for my first GenCon ever. I've wanted to go since I first saw the ads for Gencon in Dragon magazine back in the 80's. I didn't manage to get in any pre-reg games, but everyone tells me that doesn't matter. I'm planning to hit the DCC tourney's and games on demand to see what's up. I'll also be in the Embassy Suites bar most night hanging out with the DCC crew. If you're there stop by and say hi! Here's my tentative schedule. I have a feeling I will skip most of this and just wander around. Thursday 1pm - close - Exhibit Hall! I've wanted a Warhammer 40k RPG since I read (and re-read!) the Rouge Trader book. It was a Christmas gift from my parents when was I was 15. I desperately wanted it to be an RPG. Alas, it was a war game. A war game I still play to this day. I was ecstatic about the release of Dark Heresy. Finally! An actual 40k RPG! Then Black Library immediately dropped it, or went under, I forget. Then Fantasy Flight picked it up! Unfortunately, after many years of playing it's not the 40k RPG I want. 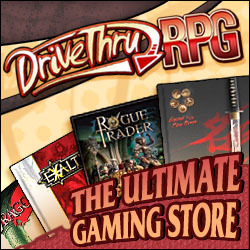 I own them all: Dark Heresy, Rogue Trader, Death Watch, Black Crusade, Only War, and Dark Heresy 2E. I've run an ongoing Dark Heresy game for 7 years, another Dark Heresy game for 2 years, and a year long Rogue Trader game. They don't work for me. 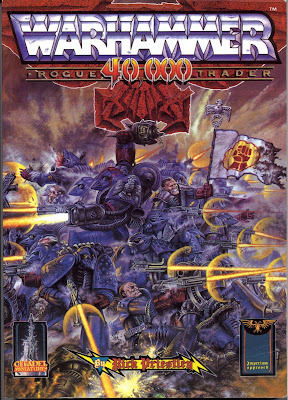 I want the 40k RPG that's pictured in Rouge Trader: a dirtier, grittier Star Wars, Space Marines hanging out in bars, mercenary Eldar, and Squats! I also need a different rule set. Even with the improvements of Dark Heresy 2E, the rules are cumbersome. My house rules have become quite extensive. I'm going to create my own 40k campaign. One with a less constrained 40k universe and different rules. I'm going to convert the rules to the BRP system (Runequest, Call of Cthulhu) If you peer deep enough at Dark Heresy you can see its Runequest DNA. I'll post a more extensive write up of my conversions in the weeks months to come. Warp travel is less difficult. In the current 40k fluff you need a cathedral sized star ship with a crew of 20,000 and a special Navigator character to jump through Warp space. Also, no one but the Imperial Navy or Rogue Traders can even have a ship. That goes out the window. Warp travel can be accomplished by small ships crewed by fewer people. The cathedral ships are still around but only in the hands of the Imperial Navy. Having a navigator is an advantage, but not required. In the original Rogue Trader book, warp capable ships can jump between star systems without a navigator. A navigator allows huge jumps, tens of thousands of light years. In the 40k milieu, if a Xenos were to set foot on a imperial planet, the Imperium would have to murder everyone who saw it and possibly burn the whole planet to ash. I want players to be able to make Xenos characters. Orks, Eldar, Tau, and Kroot are rare within Imperium space. Xenos are shunned, but not cause for OMG KILL IT WITH FIRE. Hive worlds on the fringes have an "alien" quarters where Xenos congregate. Tyranids are still monsters who will eat your face. Necrons are hidden and secretive. I like the idea of a Necron crime lord. The Imperium isn't in a state of near death. Depending on what you read, the Imperium is in a state of near constant collapse, about to be eaten by Tyranids, overrun by Orks, or burned to the ground by Chaos. In this campaign, those threats exist but in smaller scope. The Imperium is both more stable and less capable. It's a decadent, barely functional bureaucracy with islands of stability and pockets of anarchy. Every Xenos race is not constantly at war with the Imperium. The Imperium doesn't immediately declare war on independent human worlds. The characters have all rejected the Imperium. In the 40k RPGs, except for Black Crusade, the characters are Imperial agents: Inquisition acolytes, a Rogue Trader crew, Space Marines, or Imperial Guard. In this campaign the characters are a kill team for hire. They are outlaws, hereteks, rogue psykers, fallen acolytes, chaos cultists and Xenos. Rogue space marines are an option as well. Marines who have deserted their chapter but not fallen to Chaos. In effect, the campaign will look like a mash-up of Black Crusade and Rouge Trader. The Kill Team background opens up numerous possibilities for adventure. Nearly any existing 40k adventure could be used by replacing the lead-in with "You've been hired to....."
Stay tuned for more posts on this subject!